Microsoft's Aaron Greenberg and Marc Whitten lead a Community Roundtable discussion following the company's E3 media briefing, giving us further insight into the changes coming to the Xbox 360 dashboard. Officially dubbed the New Xbox Experience, the update was said by Whitten to be a response to the glut of content on Xbox Live, a system he claims was built with hundreds of pieces of content in mind, not tens of thousands — or potentially millions, as Whitten posited. The new look and feel for the Xbox 360 dashboard was designed to be navigable by those unfamiliar with the current "blades" interface, with the New Xbox Experience akin to a TV remote control UI. In person, it's pretty slick — the Xbox 360 logo radiates a constant pulse in the bottom right corner, with iTunes Cover Flow-style reflections and navigation giving gamers a quick clean look at their games and content. Fans of the current "blades" interface may be saddened to learn that the update isn't an optional redesign, it's a total replacement. They'll still get a taste of the old interface via the new Guide look and feel. Hit the jump for a photo. That's the new look of the Xbox 360's Guide, accessible from the big old Guide button on the standard controller. You'll have familiar access to your games, media and settings, via the pop up Guide, which loads faster and more smoothly than the current iteration. You'll also be able to hop directly into anything from your Games library — Live Arcade games, movies, installed Xbox 360 retail games — regardless of what you're currently using your 360 for. 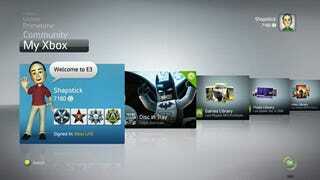 The new Guide and the NXE interface are both said to load faster, even if you have 100+ games in your library. Whitten noted that the LIVE team is very focused on optimizing the experience. ...will still work in the new interface. The gamerpics and themes you downloaded will work with NXE. And while we didn't get to see it in action, Marc Whitten swears they look "beautiful" on the new interface. Details on ripping games to your Xbox 360 HDD are still to be announced, but it appears that the only limitation on users is that the game disc must be in the drive in order to play. That means no lending your copy of History Channel: Battle for the Pacific to get around, you know, owning the thing. The feature is said to work with all Xbox 360 games past, present and future and is primarily a method to reduce load times. Xbox Live's Larry Hryb showed Netflix integration in action, updating his queue via the Web, which then updated automatically on the Xbox 360. That newly added movie was then streamed via Netflix's servers. The quality was definitely below DVD quality, but still looked good. Microsoft said more than once that they'd be releasing more information on the update — including things like what real estate advertising will occupy in NXE — at a later date. Ads weren't visible in the demo version we were shown, but we won't be surprised when they pop up in the less sexier, real world version of the interface update. With Avatars, LIVE Party and the ability to stream movies and TV shows with other Netflix subscribers while chatting, wouldn't that make for an excellent vehicle for mocking the worst of the worst movies? The wink and a smile that Whitten gave the Community attendees certainly made us think so, but we don't know if Microsoft plans on officially supporting the overlay of Avatars on Netflix video streams. At least, not in the NXE Fall update. A Web version of Xbox LIVE Marketplace is coming, but IE 360 isn't happening right now, according to Whitten. Screens of the New Xbox Experience can be seen in our gallery below.